SUMMARY: During a record heat wave, a serial killer terrorizes a small town by killing teen girls and dumping their bodies in a popular community park. Already haunted by the ghost of her best friend, who died six months ago, Hannah Wagnor begins seeing the ghosts of the dead girls. Slowly, Hannah begins to fight through her depression and guilt over Lillian's death and seeks answers about the girls' murders. As she investigates, Hannah starts to trust local bad boy Finny Boone, whom she has known since first grade but is only just beginning to really KNOW. How much can Hannah trust Finny? Who is killing the girls? Could Hannah or her sister Ariel be next? REVIEW: My review is going to seem to bash this story, and I do not want to do that. I did enjoy reading Paper Valentine, and I did find some parts engrossing. Hannah's depression and guilt over Lillian's death is real and believable. However, I can't ignore some problems with characters and plot. My main issue with Paper Valentine is that it attempts to tackle so many issues at once. The story bounces from Hannah's depression, the ghosts haunting her, her guilt over her friend's death, eating disorders, child abuse, the foster care system, mean girls, shoplifting, and romance. The sheer number of heavy issues leaves little room left over for details, resulting in some missed opportunities and plot holes. The murderer's identity and motive seem really random. Why did he kill these girls? What made him go that far? There is a weak explanation in a Scooby-Doo-esque confession, but I just didn't buy it. What do dead birds had to do with anything? Were they just from the heat wave? I live in Texas, and we've had LOTS of 100+ degree heat in the summer. I don't see dead birds dropping from the heat. What happened to the ghosts haunting Hannah at the end? I get that they stopped haunting her, but that's it? Again, weak. Why do the ghosts choose Hannah? Is it just because of her grief over Lillian, or is she a seer? Why is she so special? What happened to the murderer once he was captured? He's cuffed, and that's it? Major loose end. Finny never got into trouble over the stolen lighter, and I doubt that was his first attempt at shoplifting. I just didn't like that it was never discussed. There was no real motive behind it other than shoplifting for the sake of shoplifting. It made Finny less heroic/sympathetic in my eyes. THE BOTTOM LINE: It was okay. 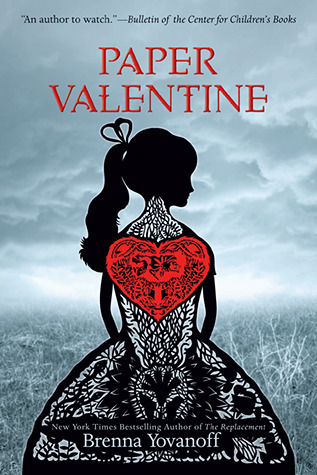 Though interesting and engrossing at times, I had too many issues with plot and character to get excited about Paper Valentine. STATUS IN MY LIBRARY: We don't have it, and unless students request it, I have no intentions to buy it for the library. It's not a terrible story, but with my limited budget, there are just better titles to choose from.